Two days ago Bob worked his first shift volunteering at the Bodyworlds 2 Exhibit, explaining the plastination process invented by Dr. Gunter von Hagens of Germany. This pioneering technology makes possible contemporary anatomical exhibits like the three Bodyworlds now touring and the many medical school exhibits which are using his patented process. Go to Bodyworlds and see if any of the exhibits will be near you in the future. If so, do not miss it. 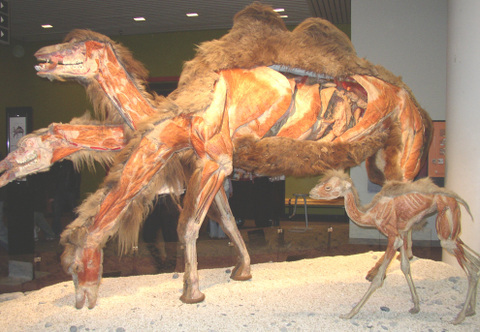 Plastinated Camel and baby with sagital-cut sections of the head and an open abdomen. 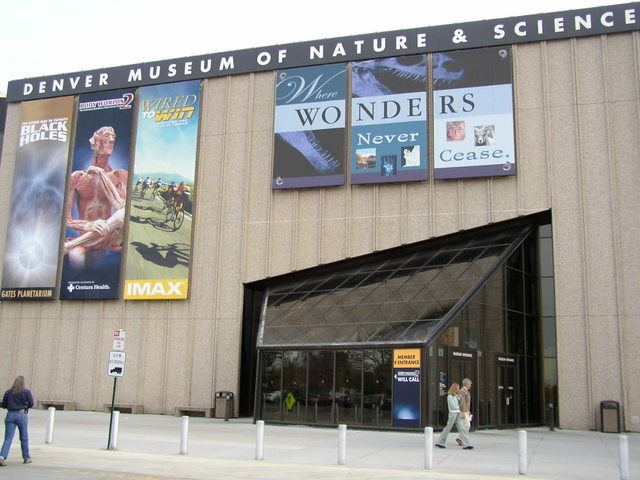 On the evening of January 25 Bob and I attended a lecture at the Denver Museum of Nature and Science. 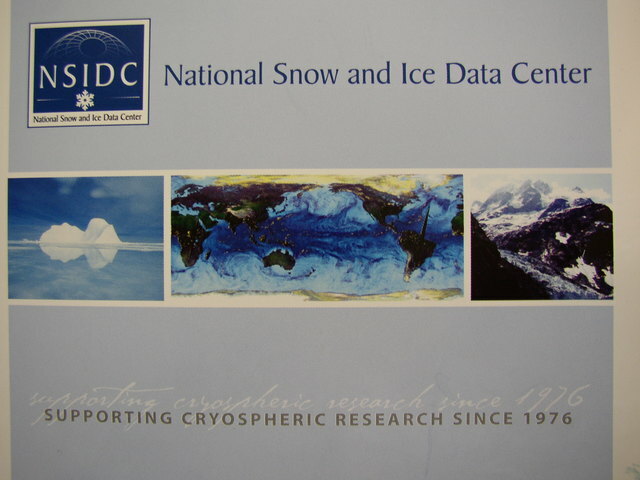 Two PHD researchers from NSIDC presented slides, information and statistics about sea ice, glaciers, Polar Atmosphere, Great Lakes Ice and general climatic changes over the years. It was both fascinating and worrisome. They showed data which indicated that in September 2002 Arctic sea ice reached a record low, then followed with data showing that it continued to decrease culminating in a new record low in 2005. They said most scholars studying the impact agree that if this trend continues, we will have no remaining Arctic sea ice by 2050 and that will result in the extinction of polar bears. It would also effect changes in ocean current flows which now warm parts of Europe, resulting in much colder climates there and hotter, dryer climates elsewhere in the world. One of the most amazing pieces of information from the lecture is that probably in 20 years the ice will have sufficiently receded to finally create a Northwest Passage. Just think of all the failed expeditions and lost lives since the 16th century, trying to find a northwest passage! I am not an alarmist but I trust that this is a serious situation that governments must no longer ignore. There may be nothing that can be done at this point but we must join the other nations of the world in trying to understand the role of humans in contributing to the problem so that we can determine if there is a change in behavior that would help alleviate it..
Until last night the word Cryosphere was not even in my vocabulary. Now it is something else for me to concerned about. 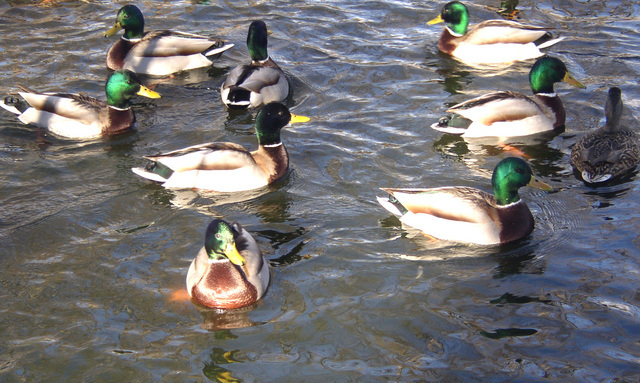 Even the mallards on Duck Lake know it's Spring. It was another beautiful day. At Duck Lake in the Denver Zoo the mallards were enjoying the sunshine while the reflection off their green heads created a colorful spectacle. In this photo our dog, Copper, is caught by the camera the one time he sat during a half hour of whirling and criss-crossing the soft blanket of snow that fell overnight. By mid-afternoon the sidewalks and streets were clear but wet and the blanket, while still covering the lawn, appeared frayed and wrinkled. 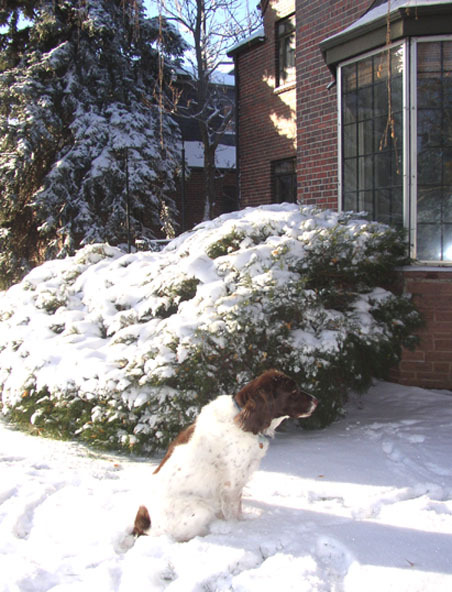 As I watched Copper, especially when I looked toward the sun, his almost white body disappeared against the snow to give an appearance of several brown blotches cavorting across the lawn. Lately I have been so busy "connecting" that I've had little time to write in Connections. Yesterday three watercolorist friends came to my house to paint. Our class is adjourned for the holidays and we found we were not painting without the motivation of the class. It was great fun. Today I took my Christmas list and did a reconnaissance run through a few stores to get some ideas. I bought no gifts but found a few possibilities. Afterwards I went to what, in my humble and biased opinion, is the World's Best Bookstore--"The Tattered Cover." to meet my friend Elaine who was driving up from Colorado Springs. While waiting I managed to find three books that I just had to have: two Insight Guides on Belize and Mexico and "One Planet" a speciality book put out by the publishers of Lonely Planet travel guides. (I plan to use the latter as a photo reference for some costuming colors for figures I am painting.) Elaine and I had a wonderful lunch and then she had to leave to get back home before the wet and slushy highway turned to deceptive and sometimes dangerous Black Ice.